In a recent post by Nathan Schroeder, an illustrator currently attached to Jurassic World, these images are believed to be the concept art for the upcoming film. It is important to note that the film has undergone several rewrites, making these pictures (dated 2013) possible subject to change. 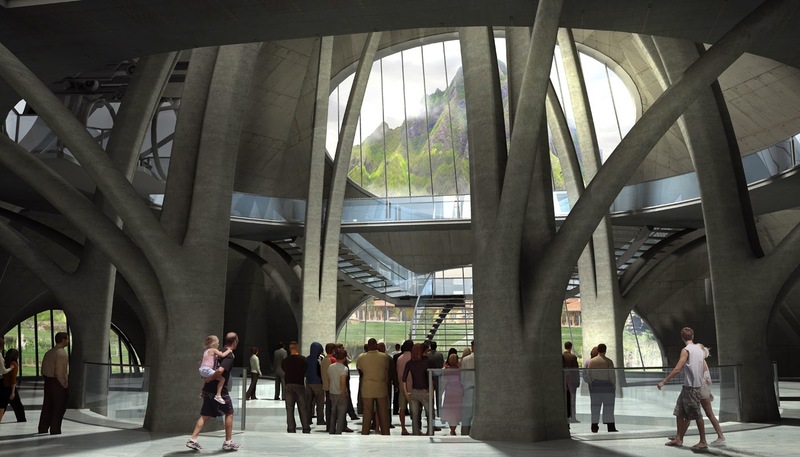 The images display the park's "Resort"/"Visitor's Centre" on an island (Kauai in our world, Isla Nublar in the JP world) that will possibly see a successful running dinosaur amusement park (think Sea World /w Dinos). The futuristic setting feels a bit like something out of a fantasy novel. Filming is expected to start in mid-April. Are you excited to see the dinosaurs wreck havoc once again? Let us know what you think in the comments below!